Bringing together members of Keelhaul and Municipal Waste together with Yakuza’s Bruce Lamont, Brain Tentacles is a power trio that swaps guitar riffs for saxophone skronks. And that’s it? Well, pretty much; although the obvious comparisons are to Naked City and other avant-garde Zorn-related projects, not to mention Norway’s Shining, Brain Tentacles are more of their own beast. Closer to noise rock at moments than jazz as we know it, the band are definitely in the avant-garde realm and will appeal to everyone that saw ‘jazz’ at the top of the page. It’s the variety and originality itself that really appeal to me, however, more than just the saxophone itself. Opener Kingda Ka and first track proper Fruitcake are what you’d expect, weird drum-heavy intro and dementedly catchy ‘single’ type song respectively, but the nine-minute Cosmic Warriors Girth Curse immediately throws caution to the win by opening with barely accompanied saxophone riffs, turning sludgy as the yelled vocals and rhythm section join in. The track moves smoothly from heaviness to pure psychedelic rock as the saxophone echoes away before being joined by a smooth, near stoner rock beat. After that, Hand of God and Gassed are relatively straightforward sax-rocking, feeling like the band jamming together, although the intro to the latter features a skit of people mocking saxophone in rock n’roll; the band have a sense of humour about themselves! 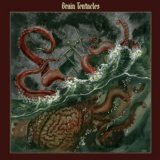 Favourites are subjective to taste, but Brain Tentacles are at their best when at their heaviest, for me, like on the short but sweet The Spoiler, which is practically grindcore. Tracks like the meandering Death Rules can feel a bit too loose and throwaway, as novel as it all is, and unless you’re really in love with the saxophone you might find yourself thinking that a bit less would have been a whole lot more. Slower, softer moments like the restrained Fata Morgana can have their own woozy charm, the atmosphere suitably dark and noir-y thanks to the sax. But ultimately Brain Tentacles can seem a little unfocused, which makes sense; the background of the band is that it was put together as an opening act for Melt Banana a couple of years ago. And although the saxophone as an instrument in rock music can work very well, it still can feel like something of a gimmick; Brain Tentacles are a talented trio, but not even they can escape that sense of gimmickry entirely. Even so, I found this original enough and out of my normal listening at least to recommend as being worth a go if you’re interested in the concept.